Georgia Department of Transportation will begin a resurfacing project that will impact the travel of residents and businesses in the Cumberland CID Area. **PAVING HAS BEEN CANCELLED FOR THIS WEEKEND. Scheduled to begin TBD on I-75 northbound and southbound between Windy Hill Road and Canton Road. In addition, crews will start work on the I-75 northbound to Cumberland Boulevard exit ramp. 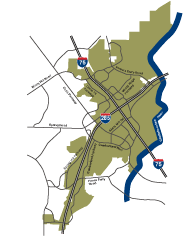 The project will resurface almost 11 miles of I-75 from the Chattahoochee River to just north of Allgood Road; I-285 eastbound from Cobb Parkway to just west of the Chattahoochee River Bridge; and all ramps and CD Lanes not included in the Northwest Corridor project.